JUBA, Dec. 18 (Xinhua) -- South Sudanese are hoping to count on Chinese technical support to boost its agriculture sector as the country tries to cut over-reliance on hydrocarbons to revive a economy battered by five years of conflict. Sebit Charles, a 45-year-old agricultural mechanic who recently attended a training program provided by five Chinese technicians at Kapuri agricultural technology transfer center in Juba, said unlocking South Sudan's huge agricultural potentials requires investment in skills. "I have benefited a lot in terms of skills because now I am able to operate and maintain the walking tractors and combined harvesters," Sebit told journalists during an interview on Monday. "Definitely I am going to teach more people so that they also go and teach others." He said South Sudan needs to rely on technology to revive its agriculture, which has suffered setback due to conflict as well as crop pests and diseases. Sebit can now operate several kinds of machines donated by the Chinese government to reinvigorate the agricultural sector and help guarantee a path to sustainable food security. The 349 pieces of machinery donated by the Chinese government include grain combine harvesters, walking tractors, seeders, potato planters, and potato harvesters. South Sudan hopes to be a regional food basket by implementing its five-year agricultural policy framework and a 25-year comprehensive agricultural master plan. The country has vast arable land and 38 million livestock. Currently oil and mining dominates the economy in terms of revenues, accounting for 98 percent of the fiscal budget since the country's independence from Sudan in 2011. Acuil Atak, 50, a worker with the Aweil rice scheme run by Chinese technicians in the northern Aweil State, said he intends to go back to his hometown and train his colleagues on how to use some of the equipment. "I want to train more people in our state," Atak said, adding that 12 others from Aweil receiving training with the Chinese also hope to go back and train more people in their home state. Atak hopes to visit China someday and learn more about its agriculture sector in the future. Charles Sokiri, another trainee, said local farmers have been working with rudimentary tools to plough the land and that he hopes these state-of-the-art machines will help improve food production. "These machines are very good because they are easy to operate and more of these types of machines should be brought to South Sudan," he said. "We need more people to train with these machines because we need to attract many people into agriculture." Yang Mengjun, business manager of Xuzhou Construction Machinery Group, which conducted the training, said they are delighted to have trained South Sudanese on operation and maintenance of these machines and that they will continue training more people. "This is just the beginning. We are here still to continue training and help more South Sudanese to acquire skills on using technology to improve the country's agricultural productivity," she said. 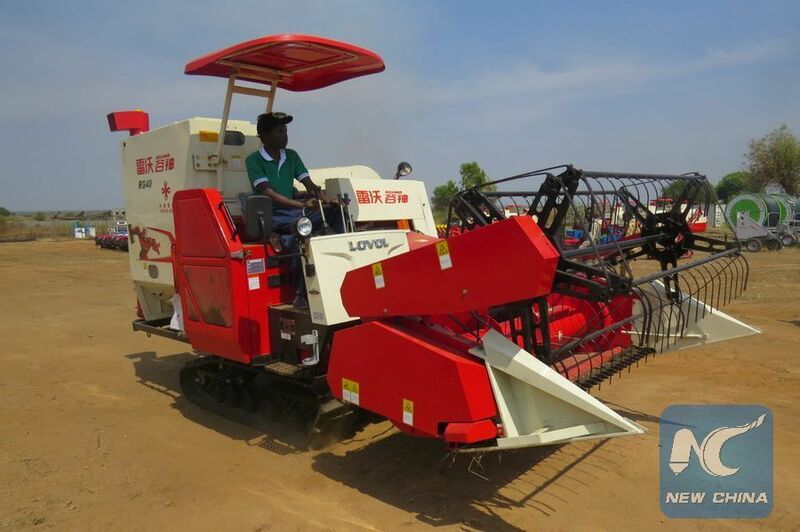 Onyoti Adigo Nyikuac, South Sudan's minister of agriculture and food security, said these machines will help many people and also support the government's bid to move away from the rain-fed agriculture to commercial farming. He said the Kapuri agricultural technology transfer center needs to encourage more South Sudanese to acquire skills in research and innovation in agricultural sector. Juma Stephen Lugga, Jubek state minister of agriculture, said this year, with a revitalized agreement ushering in peace, his state is aiming to increase food production. "This year we want to produce much crops under this peace. We need to maximize these trained technicians so that more are trained," Lugga said.